During the 2012 Republican presidential campaign, Rick Perry, former governor of Texas, candidate and now Donald Trump’s Secretary of Energy said, “…I simply want to get America working again and make Washington, D.C. as inconsequential in your life as I can.” 1 We don’t see how he could have been serious, but he was. In 2010, the Supreme Court’s Citizens United case held that corporations, as “associations of individuals, “ are like people, having the rights of free speech, and can therefore contribute to U.S. political campaigns. In 2012, the election cost $ 7.0 billion, up 32% from $5.3 billion in 2008. 2 Both these ideas are not mainstream political ideas; but as we shall see, they also have deep roots in American culture. The Tea Party is a radical Republican group, founded to advance these ideas. Founded in 2009, their no compromise beliefs in minimized government, guns and laissez faire economics result from a complex of reasons. As this is a political economics website, our emphasis is much more on the impact of the economic fundamentals upon markets and on the logical decisions of individuals. But there is, of course, another less logical side to human nature that we have discussed as romanticism, and that is also manifest in societies, politics; and, of course, the short-term reactions of investors to events. The Wikipedia defines German sociologist Max Weber’s verstehen (literally, to understand) as follows. : “Verstehen is now seen as a concept and a method central to a rejection of positivistic (i.e. empirical) social science.….Verstehen refers to understanding the meaning of action from the actor’s point of view. It is entering into the shoes of the other, and adopting this research stance requires treating the actor as a subject, rather than an object of observations…Individuals are seen to create the world by organizing their own understanding of it and giving it meaning.” 3 We think the following analysis matters to the understanding of present day U.S. politics. Arlie Hochschild is a highly regarded professor of sociology at the University of California, Berkeley. In 2016, she wrote a book with the harrowing title, “Strangers in Their Own Land.” To better understand the political attitudes of the far right, she asked how it was possible to simultaneously oppose both government regulation and pollution. Over a period of five years, she visited Tea Party supporters who lived near the petrochemical refineries of Lake Charles, Louisiana, where the good times definitely do not roll. She found the people there, although in very difficult circumstances, to be welcoming of her and caring for each other; they found her not to be a Communist from the People’s Republic of Berkeley. In liberal democracies, voter behavior is formed by a complex intertwining of basic attitudes towards life; history itself, interactions with the surrounding society; and political thought. Although the author does not do so, for the sake of simplicity, we consider these as separate factors. This allows us to assume that people view the political landscape through various lenses before voting. The Betrayed – “(He) had worked at hard, unpleasant, dangerous jobs. He had loyally followed company orders to contaminate an estuary. He’s done his company’s moral dirty work, taken its guilt as his own, and then been betrayed and discarded himself, as a form of waste. “Yet over the course of his lifetime, (he) moved from the left to the right….For a while his central life experience had been betrayal at the hands of industry, he now felt - as his politics reflected – most betrayed by the federal government. He believed that PPG and many other companies had done wrong, and that cleaning the mess up was right. He thought industry wouldn’t, “do the right thing,” by itself. But on the role of counterweight, he rejected the federal government, Indeed, (he) embraced candidates who wanted to remove nearly all the guardrails on industry and cut the EPA…..
“In the life of one man…I saw reflected both sides of the Great Paradox – the need for help and a principled refusal of it….his source of news was limited to Fox News and videos and blogs exchanged by right-wing friends, which placed him in an echo chamber of doubt about the EPA, the federal government, the president, and taxes. “Indeed Tea Party adherents seemed to arrive at their dislike of the federal government via three routes – through their religious faith (the government curtailed the church, they felt), through hatred of taxes (which they saw as too high and too progressive), and through its impact on their loss of honor…” They also hold the federal government responsible for environmental regulations that result in the loss of jobs. Like the plantation system of the past, the new economy is extractive. “The new cotton is oil…Like cotton, oil is a single commodity requiring huge investment and has, like cotton and sugar, come to dominate the economy….On the positive side, oil offers to restore lost honor. For if the plantation system brought shame to the South in the eyes of the nation, oil has brought pride.” 9 But there is a high cost . The petrochemical industry is a process industry, requiring high capital investment and generating not that much employment. Money from outside the state flows into these industries, and then flows right out, rather than financing new businesses, leaving Louisiana poor and polluted. In 2015, the state ranked last in health. 10 One hundred fifty petrochemical facilities line an 85 mile strip of the Mississippi, known as Cancer Alley. Louisiana appears to be affected by the developing world’s “oil curse,” where the government does not expect that much of their citizens, and that attitude is reciprocated. The author notes that the states can adopt two economic development strategies. The grow revenues strategy that California and Washington State adopted was to, “stimulate new jobs by creating an attractive public sector” environment, where skilled people want to live, among other things. The lower costs strategy Louisiana adopted was to import jobs from other states by, “Union bans, lower wages, corporate tax rebates, and loose implementation of environment regulations...” 12 The first strategy depends upon regional innovation, which requires a greater emphasis on education and new companies. The political justification to minimize government has its origin in the 17th century Enlightenment, a revolution against Church and State. The alternative to the hierarchical powers of both was the alternative assumptions that individuals were equal because they had in common the faculty of reason. 13 Such beings were assumed to be self-regulating; human nature was good and did not require much government. Beginning with the assumption of an original economic equality, that opportunity required and that in fact generally pertained when America was first settled, a branch of the liberal philosophy then justified the resultant hierarchical and conservative economic and social order that the South fought to preserve in the Civil War. 14 As Professor Hochschild relates, resonances of that battle exist to this day. The above illustrates that Tea Party support is deeply rooted in basic attitudes towards life; history and society; and the political theory that gives meaning to it all. To summarize this, Professor Hochschild narrates a “deep story” that describes how people feel about things. The 2016 election illustrated that it is dangerous to democracy for there to be a large group of very discontented voters. Political reform is obviously necessary at both the federal and state levels. At the economic level, people need hope, a hope in an economic growth that the federal government can catalyze and a new governor in Louisiana might someday direct, after he cleans up the fiscal mess left by the previous administration. At the redistribution level, the fruits of economic growth should not just go to the top 10%. The following is for voters who value rationality in their political opinions - where the adopted means bear some relation to the ends. The Republican program of very limited government is unworkable, offering no solution because it destroys social cooperation and contradicts - human nature, U.S. history and the implementation of government policy. 1) In a 1944 lecture called, “The Children of Light The Children of Darkness,” the theologian Reinhold Niebuhr questioned the core assumption of a self-regulating human nature. In this now American conservative ideal – people, communities and economies were essentially held to be self-regulating. But the dynamic of the ungoverned industrial economy of the 19th century released social forces that tore apart the communities in which men lived, resulting in two world wars. There is a now glaring contradiction in American conservatism between an untrammeled laissez-faire economic philosophy that allows automation and globalization to destroy communities (and of course social cooperation); while at the same time fostering a political climate that demonizes “the other” for the result. The ideology of a very limited government now benefits two different classes - the top 1% get the bread and the disadvantaged get the circuses, deteriorating democracy, The maintenance of democracy substantively requires a rough equality of circumstances, requiring some government redistribution – as international trade theory also requires. 2) The complex system of international relations and commerce is, itself, a post-war U.S. creation requiring U.S. leadership. At this writing, the Trump administration proposes to impose large tariffs, disadvantaging other Americans, to protect specific industries. Economists and businessmen say there more effective ways of increasing salaries and American jobs. At the most obvious level, American workers need to become more appropriately trained, an investment that must be made by someone. Very limited or ineffective government has resulted in unsolved problems, electoral anger and a lashing out at “the other.” Furthermore, laissez-faire economics at home and strident nationalism abroad resulted in past catastrophes. They caused the Great Depression of the 1930s (as the banking system was allowed to fail), Iraq (lashing out at Saddam Hussein, which enabled the rise of Iran), and the Great Recession of 2008 (resulting from unregulated finance). In contrast, the Democratic party is now running local candidates who can speak to the real constituent issues of regional economic development, labor and social insurance; rather than to magnify cultural issues, which may or may not include race. A major challenge is reunifying America by more effective government; some things are better handled locally and others nationally. Government can create real jobs for people (for things that need to get done but aren’t), prepare the private workforce for the jobs of the 21st century (by helping to create new local opportunities), improve medical care (by enhancing national funding), reduce those trillion dollar yearly deficits, and prepare American society for the impacts of increased automation and global warming. Many people in Europe and the United States have not benefited very much from overall economic growth over the past few decades, and skeptical of the policies and leaders in place. But the solution is not to throw out the liberal order. It is to complement it with government policies that allow people to share the benefits. People use ideas to deal with a complex reality. The idea of very limited government, we have seen, can be used to answer political questions. The idea of a laissez-faire free market can be used to handle economic reality. Both ideas are twins. The superiority of free markets is frequently used to justify the political program of very limited government, assuming that the benefits of growth in the former will accrue, in general, to the latter. But do totally free markets accurately reflect economic reality? All introductory economics courses will start with the idea of an equilibrium price model, where the price for a good (P*) and the quantity produced (Q*) is determined at a point where the supply and demand curves intersect. * Getting back to the empirical basics. Has anyone seen real supply and demand curves? 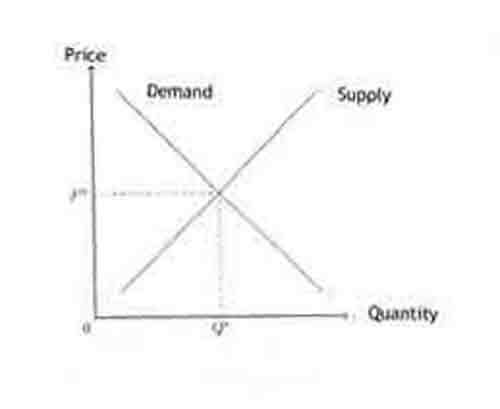 If an upward shift in the supply curve - say due to increased costs - causes a price increase (P*), the quantity demanded (Q*) will decrease. But what is observable is only the intersection of the supply and demand curves, not the actual curves themselves. Because an economy is a complex and interrelated system, where supply and demand curves constantly shift, it is difficult to find variables to trace an economy’s real supply or demand curves. Therefore, the responsiveness of an economy to changes can’t be precisely (and mathematically) predicted. This imprecise model will cause the invisible hand of the market to fumble. It should not solely determine the organization of the much broader society. In a 5/24/18 NYT article, Harvard economists Edward Glaeser and Larry Summers suggest a focus on America’s “Eastern Heartland,” those non-coastal states bounded on the west by Michigan and Louisiana. They write, “Federal policy can’t bring the Rust Belt back to its former glory, and we shouldn’t try to artificially relocate economic activity to less productive places. But we must do more to fight the scourge of long-term joblessness, and we should focus our efforts in the places where joblessness is most severe….To meet this challenge, many economists have argued for a universal basic income or a more generous earned-income tax credit. We would support an E.I.T.C. expansion. But the most direct way to encourage work is with a new (targeted and less expensive) wage subsidy that benefits workers and encourages companies to replace joblessness with employment. Here, Professors Glaeser and Summers recommend a “market forces” solution rather than regional economic development, around hubs centered upon universities (like Palo Alto, Ann Arbor or Pittsburgh) and other enterprises. This is also a topic for development economists. The reasons for this are partly demographic, the younger people are more likely to leave; and partly occupational, the jobs in the city now require higher levels of training. Also, as the article notes, people want to live in their communities. For social, long-term economic and political reasons a regional development strategy seems to make sense.